What is today? 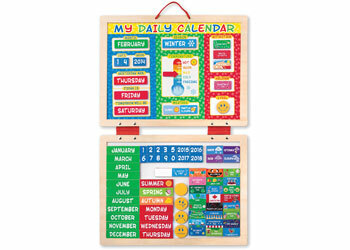 For a child, that simple question can have so many answers--and this daily calendar helps satisfy them all! 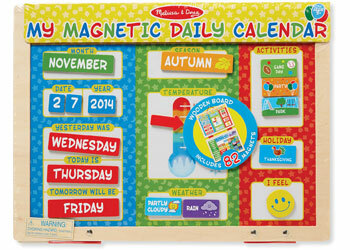 Kids will feel a greater sense of control and responsibility when they help post the day of the week, date, weather, and special events on the large magnetic board for all to see. There's even a space to post their mood, which is an excellent way to open communication and encourage children to gauge their own emotions. Updating the information is simple: Simply take a pre-printed magnet from the lower magnetic board (which hangs below the calendar to keep magnets within easy reach). Then place it on the calendar to fill in the information or make a custom magnet by writing on one of two dry-erase magnet tiles! There are fields for day, date, season, weather, temperature, activities, holiday and mood.